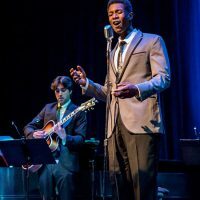 Chicago sensation Evan Tyrone Martin (Jesus Christ Superstar, Side Show, Oklahoma) warmly resonates the velvety vocal style of musical legend Nat King Cole. Chicago Tribune calls the Award-nominated Martin "Destined for Stardom: One of the Hot New Faces of Chicago Theatre," and BCR News praises, "Martin's vocal ease would have done Nat King Cole proud." Martin intimately relates Cole’s personal journey, while presenting a festive cocktail of hits including "L-O-V-E," "Mona Lisa," "The Christmas Song," and "All I Want For Christmas Is My Two Front Teeth."